Communication Systems Solutions’ VZ2 PTP Network Time Servers are specifically suited for Verizon's Enterprise Network Extenders where coordination of events at multiple locations is required. Without coordinated network time, searching for problems across multiple system logs becomes much more difficult. Education, industrial facilities, military installations, public safety command rooms, government, broadcasting, and hospitals are all candidates for synchronized time systems. 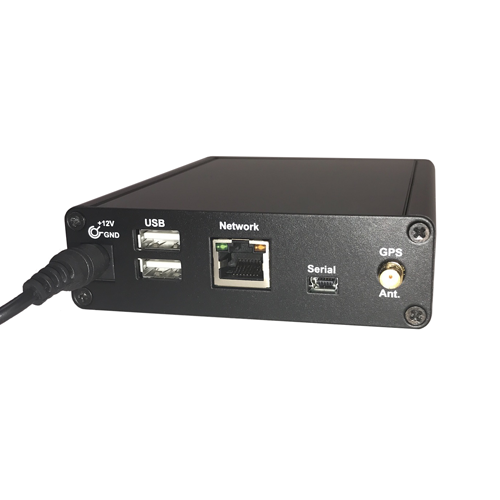 With a VZ2 PTP Network Time Server on the local network, synchronized time is assured no matter the state of your Internet connection. Time accuracy is greatly improved when compared to Internet-based time sources because the delay is reduced to that of the local LAN segment. The VZ2 PTP Network Time Server represents a major step forward in communications technology. The VZ2 supplies accurate time for computers and timekeeping devices on the network. The VZ2 supports Precision Time Protocol (PTP). 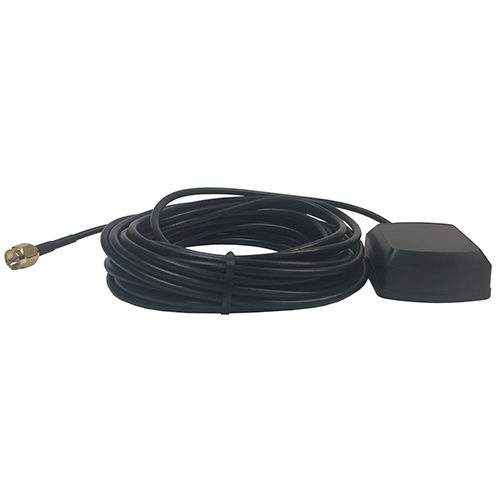 It uses an active GPS antenna to maintain the current time as broadcast by United States GPS satellites. In addition, a highly stable OCXO reference clock is included allowing it to serve time if GPS lock is lost for periods of time. A femtocell is connected to the Internet to create a Voice over IP (VoIP) signal that covers a small indoor area. What's Included with my VZ2 Order? Products manufactured and delivered under this agreement to the purchaser are warranted by Communication Systems Solutions, Inc. (CSS) to be free from defects in workmanship under normal and proper use for a period of one (1) year following its date of delivery. The obligation of CSS under this warranty is limited to repairing or replacing, at CSS’s sole option, free of charge, FOB CSS, any product which fails within the one year warranty period and is returned to CSS with an RMA obtained prior to returning the product with a written description of the claimed defect. The foregoing warranty will not apply if the product fails to function due to abuse, misuse, accident, neglect, unauthorized repair or incorrect installation, failure due to electrostatic discharge, exceeding environmental specifications of the equipment, failure of electrical power, air conditioning or humidity control or causes other than under ordinary or expected use after delivery. The foregoing limited warranties and limitations of remedies are exclusive warranties remedies and are in lieu of all other warranties express or implied, including, but not limited to, any warranty of fitness for a particular purpose or of merchantability. the stated express warranties and remedies are in lieu of all liabilities or obligations of a manufacturer for damages for breach of warranty, including but not limited to, direct, indirect, consequential, special and incidental damages. In no event will either Communication Systems Solutions, Inc. (CSS) or purchaser be liable for (i) special, indirect, incidental or consequential damages, or (ii) any damages resulting from loss of data, frustration of economic or business expectations, loss of profits, revenues or use arising out of or in connection with this agreement or the use or performance of any products or services sold or provided hereunder, regardless of whether Communication Systems Solutions, Inc. (CSS) or purchaser, as applicable, has been notified in advance of such damages. the remedies provided for in this agreement are the sole and exclusive remedies for both parties. 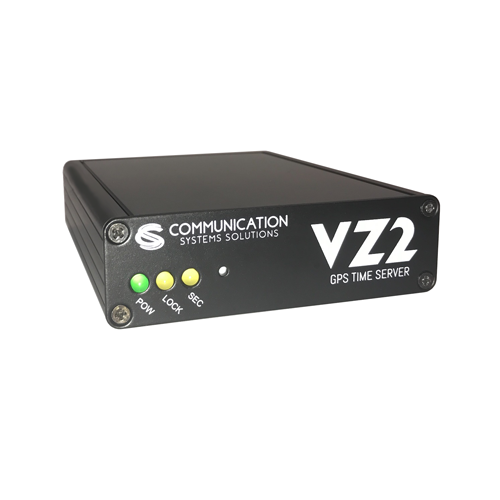 Communication Systems Solutions is proud of launching VZ2. A Verizon PTP Network Time Server. 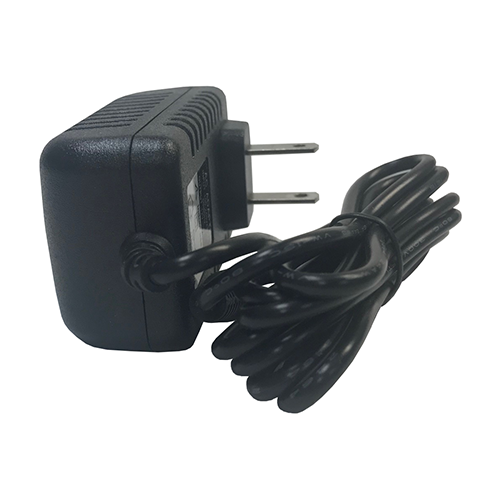 This product offers location information to Verizon’s Enterprise Network Extender. Learn more about ordering our PTP Time Server at our orders and shipping page. Communication Systems Solutions’ Verizon PTP Network Time Servers (VZ2) are specifically suited for Verizon’s Enterprise Network Extenders where coordination of events at multiple locations is required. Without coordinated network time, searching for problems across multiple system logs becomes much more difficult. Education, industrial facilities, military installations, public safety command rooms, government, broadcasting, and hospitals are all candidates for synchronized time systems. 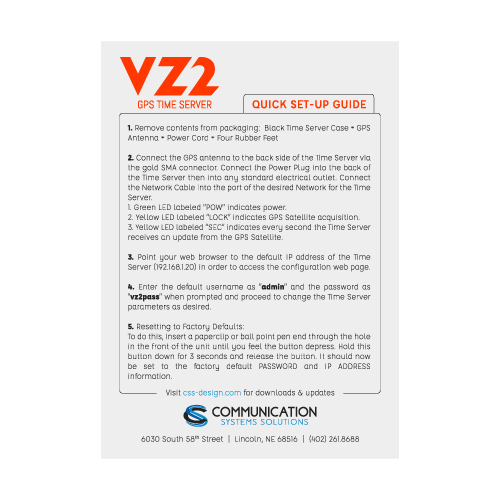 With a Verizon PTP Network Time Server (VZ2) on the local network, synchronized time is assured no matter the state of your Internet connection. Time accuracy is greatly improved when compared to Internet-based time sources because the delay is reduced to that of the local LAN segment. What’s Included with my VZ2 Order? Officially launched in 2004 in Lincoln Nebraska, CSS is a full-service technology company, engineering and manufacturing multiple types of products for multiple types of businesses. 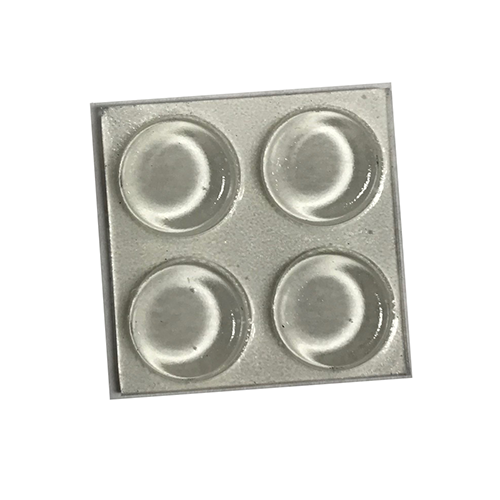 We take our work seriously, as we design and manufacture important health-related and time-sensitive products, among many others. Corporate headquarters in Lincoln consists of everything we have to offer, including hardware + software engineering, contract manufacturing, product support, inventory, marketing and shipping/receiving. We’re your full-service turnkey solution!